Signe has served as organist at First English for many years. Study of the organ began when she was a student at Butler Area Senior High and continued during four years at Thiel College, where she majored in music. In later years, she eared a Master of Music at Duquesne University with focus on sacred music and organ students. Signe still enjoys organ studies with David Billings in Pittsburgh. 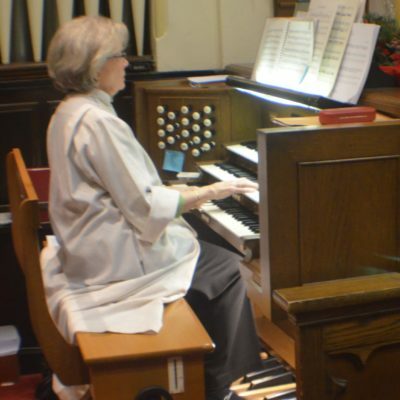 She is a member of the Pittsburgh chapter of the American Guild of Organists, where she has earned the certificate of Colleague. Signe is passionate about the ways the joy of music can become a special part of our lives and the way we hear and spread God’s word. She believes that throughout life there is always something new to learn about the Lord’s message to us, and all folks are invited to be a part of that message which is received and shared through music. Come and join us! One of Signe’s fondest memories took place years ago when she was singing with the Thiel College Choir. On its last week of a tour through Europe, the choir went to Helsinki, Finland, to sing and be part of a gathering of the Lutheran World Federation in 1963. She has never forgotten it!